I read recently somewhere online, “You haven’t been to the Philippines until you’ve walked home in the rain.”. Well, if that’s true then I got my initiation my first week here.. without an umbrella. It had been hot as blazes during the day, sun shining, the whole bit. So when the sun began to set it didn’t even cross my mind that it might rain. So I walked into town (about a five minute stroll) and enjoyed some time at a place that has now become my favorite cafe, ‘The Cafe Malmo‘. After a few hours there I finally decided to return home, exited the door and I was only a few feet away when the drizzle turned into a downpour. I simply resigned myself to the fact that I’d be wet by the time I got home and enjoyed the experience. Back home, in California, if it was raining it was usually also pretty cold. Getting caught in the rain in So Cal meant chilling yourself to the bone and getting your shoes all wet. But not so here. Here I was wearing sandals.. so no big deal. And even though it was raining heavily, the temperature was still a warm 78*F. With the slight breeze that brought the storm in from the South-West, it felt good. It felt the way rain ought to feel but never did. 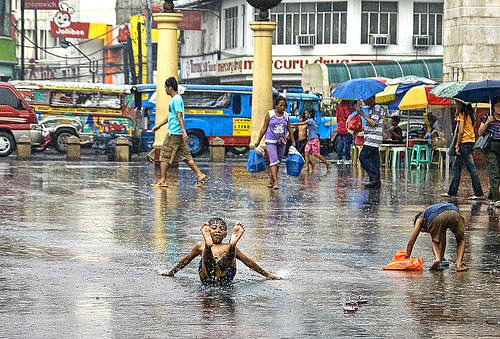 From having spoken with some of the locals about the suddenness of the rain at almost any given time during the typhoon season, which is merely rain by the time it reaches Cebu, they told me it’s very common to let the kids run outside into the rain. Back in California you just don’t do that. Although there was the one winter I went out into the pounding rain to enjoy the hot-tub which the management had forgotten to turn off. I figured it shouldn’t go to waste and sat there in the hot-tub during a chilling downpour. Many years ago, while living in a commune with people I met from all over, I met a woman from Africa. At the time there was a song out called, “(I Miss The Rains Down In) Africa“. I asked her what was so different about the rain in Africa. She simply said, “The rain is hot, not cold like you have here.” For years I tried to imagine warm rain.. having never experienced it I just could not imagine it. To me, rain meant cold weather.. Christmas and staying warm inside with some hot tea. But here, in the last two weeks I’ve walked home in the rain or drizzle several times.. now with an umbrella. It’s still a calculated guess whether to leave the house with it or not. Just earlier today I knew I had to stop by the bank just over a mile away and, at the last second, decided to take my umbrella with me. It’s a short, compact one that quickly snaps open with the press of a button. And it quickly regresses with the press of another button, very cool and James-Bondish. I got a ride to the bank and by that time it was raining. After leaving the ATM I debated whether to flag down a Trike-sidecar or walk the mile back home. I opted to walk, I needed the exercise. And so I pressed the button and ‘bamm’.. I had my umbrella. Now, it’s not as romantic an experience as you might think to walk a mile on a main road in Lapu Lapu, raining or not. There are no sidewalks and the side of the road is incredibly unpredictable. Potholes, cement, rocks, loose gravel.. constantly changing terrain every ten feet. You learn to navigate while walking in this area of Mactan or you will certainly trip in no time. Add to that the traffic and the rain. Yet, despite all this I actually had a relaxed and enjoyable walk home. My umbrella kept me protected from the rain but my shirt was completely drenched from the sweat of the exertion and humidity. Today’s rain was a medium rain, a steady downpour but no flooding of any kind. Last week when I left the house, by the time I got to town the rain was coming down so hard it was running like a small river along the sides of the street. At the front of a main intersection the large, man-hole sized drain could not take in the water fast enough and the septic water was actually flooding out and into the street. Not pretty but the pounding rain kept it moving along. For this reason I will take a shower after returning from walking in the rain. I’d need it anyway from all the sweating, but also to run some light alcohol along my feet and lower legs just to make sure nothing strange could get into a cut or mosquito bite. All things considered, walking home in the rain is a welcome experience for me now. Before I just hated to get caught in the cold rain. Now.. it’s kinda nice. Right now it’s midnight and the rains stopped hours ago. The evening air is a bit cleaner and cooler with a slight breeze. That’s a welcome moment here from the usual heat and humidity. 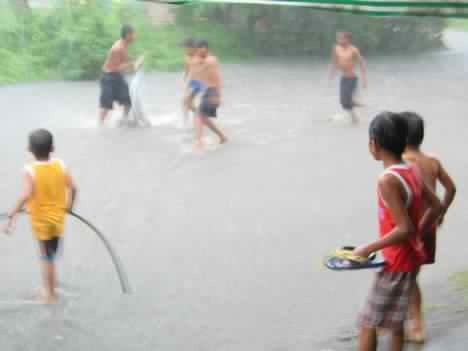 I do believe I like the rains, down here in the Philippines. I hope I’m never gone too long that I’d begin to miss them. Previous Post:[Photos] A Fun Visit To Mandaue..
Next Post:[Photos] Dance Contest at Guisano Island Mall.. I love the rain on Panay….so looking forward to laying in the hammock listening and watching the rain for hours!